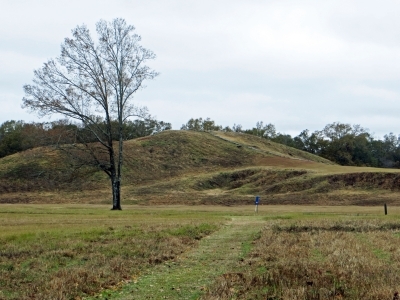 The Monumental Earthworks of Poverty Point are a man-manmade landscape that was used for ceremonial and residential purposes. It consists of 5 mounds and 6 concentric earthen ridges. The earthen constructions were built by local hunter-gatherers, between 3,700 and 3,100 BP. The vast majority of artifacts uncovered at Poverty Point are small, baked shapes made of loess, which are usually balls, bicones or ropes. These fired earth objects were used in cooking. 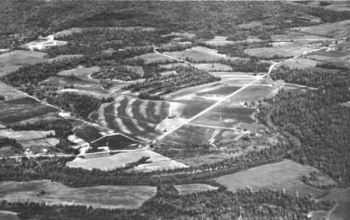 'Poverty Point' was named after a nearby plantation. The Monumental Earthworks at Poverty Point in northeastern Louisiana is the latest US World Heritage Site addition to recognize pre-Columbian cultures. The earthworks are the remnants of a culture that lived along the lower Mississippi River over 3000 years ago, and, although trees have grown and roads have been built, many of its mounds can still be appreciated in a walk around the site. I visited Poverty Point on a grey December day two years ago, and had the park almost to myself. After visiting the small museum, with its archaeological exhibits and overview movie, I started on the trail circumnavigating the site, aiming for the large, distinctive peak of Mound A, also known as the Bird Mound. From the top I could just barely make out the arcs of six concentric rings stretching out through the woods and fields, as well as smaller mounds on either side. The purpose of the mounds still confounds archaeologists, who postulate the area could have been anything from a settlement to a ceremonial site. The distinctive order to the mounds was hard to appreciate from the ground, so I highly recommend also looking at the site via Google Earth. I enjoyed my visit to Poverty Point, but I can understand the lack of architectural remains beyond the mounds will likely leave this site less popular to visitors than pre-Columbian sites in the west of the United States, such as Mesa Verde. Logistics: The Monumental Earthworks at Poverty Point requires private transportation for access. This city predates agriculture on the continent, and is located in Louisiana. The circular design is functional in many ways. There are six semi circular mounds that remain in concentric rings. The avenues that cut through the rings out of the city correspond to setting points of the sun on solstice days. Houses were constructed on the circular mounds in rows. No evidence of maize has ever been found on the site which covers hundreds of acres. As many as ten thousand people may have gathered here during the Summers. The erosion has taken away some of the structure over thousands of years of flooding. They had clay, little stone, and very little wood to use in that area at the time of habitation. The huge mound is seven stories high and is in the shape of a bird. There was little fire wood in the area, and clay briquets were heated in central fires and carried in clay pots to floor recesses in homes, and were used for cooking. Thousands of these decorated clay pieces, adorned with clan symbols are exhibited at the site in a museum on site. I saw dozens made in the shape of little owls. Red hot they would have held heat for a long time. PS We arrived on a day when the temperature was near 95 degrees and the humidity somewhere between sweat and swimming. I crossed the six ridges of semi circular mounds and bounded up the almost seven story bird mound to take in as much as I could in one view. I had read about the site for years, and it was greater than I had imagined. The museum was good but not many took the walking tour that day. The site is so large it was not even recognized as all one site until satellite imagery showed its real size. The oldest publicly-accessible evidence of ceremonial culture in North America -- and the largest earthwork in the world (I think) - and it's NOT a World Heritage Site? That simply does not make sense. Unlike most other earthwork sites, this one still sites in a landscape much like it did at it's peak, enabling visitors imaginations to form an idea of life for these moundbuilders. Not only is the main site still mostly intact, the outlying mounds are as well -- another rarity among earthworks. Group it with the even more ancient nearby Watson Brake, in university hands, and the mounds on the Frenchman's Bend Golf Course, and created is a prime example of the roots of humanity in North America. No Buffer Zone: Insc 2014 without buffer zone "The nominated property enjoys the highest level of protection at the national level as well as a well-established and effective management that ensures adequate maintenance and presentation to the public.However, the absence of a buffer zone coupled with a high density of archaeological features located in the vicinity of Poverty Point and a legal framework which protects designated properties only from publicly-driven or funded development activities raise some concerns with regard to the retention of the integrity of the property in the long term" (AB Eval)..... ICOMOS asked that additional safeguards/actions "should be put in place to act like a buffer zone"